Masahiro Hashimoto, Senshoen bonsai garden in Takamatsu's Kokubunji town, is famous as an artist who makes a specialty of Nishikimatsu. His late grandfather, Senji, is the first generation, his father, Masaichi, is the second, and he is the third of the garden. There are many Nishikimatsu including the old trees which his grandfather and farther grafted. Hashimoto is taking care of Nishikimatsu Suehiro at Senshoen bonsai garden in Takamatsu's Kokubunji town which his father grafted just after the War. Since Kiichi Suezawa, the greatest contributor of bonsai, succeeded in grafting Nishikimatsu in the middle of Meiji era, Kokubunji area has been known as the birthplace. It is a variety of Kuromatsu and the attraction is the dynamic split of bark and the ancient atmosphere. In the golden age of bonsai in Showa 40s, Nishikimatsu was very popular. Especially in Kokubunji, it was cultivated in all fields. However the price dropped sharply due to overproduction. Now only Hashimoto is the specialty grower. Hashimoto says with motivation, "Nishikimatsu is cheap for the years of cultivation and decreases in popularity. But the pine is the tradition and pride of Kokubunji. I hope to regain the popularity by developing new species which is small and fits the time." There are many old trees of Nishikimatsu in Senshoen bonsai garden. Actually Hashimoto is growing two new species of Nishikimatsu. 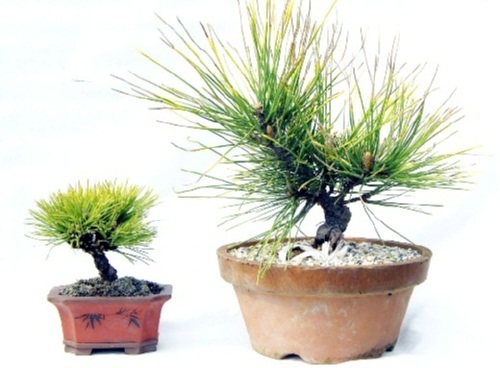 Both are mutations of the trees in his garden: Yatsufusa of Akame Suehiro and Ougon having golden needles. Yatsufusa is Shohin which is 10 centimeters in height. It has been only 3 years after grafting to a stock of Kuromatsu, but it already has the typical bark split of Nishikimatsu. As the name suggests, it also has many buds. Ougon may become popular with the unique colored needles of yellow or gold. Now it is just an experimental cultivation, but if the young trees are moved from pot to field, they will be bigger and many scions can be made from the trees. 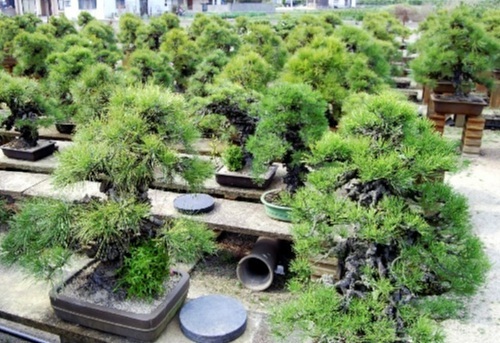 With the scions, many trees can be produced by Tsugiki which can be shipped to the market. 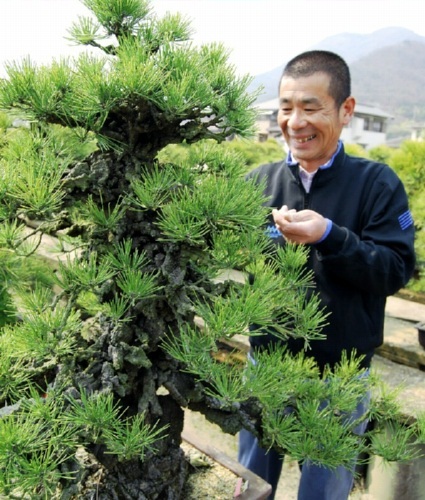 Hashimoto says, "If the pine sells well, the number of growers will increase. The small one is as cheap as flower and young women can buy for a present. So I try to make the original works by making Shohin or using the colorful pots."